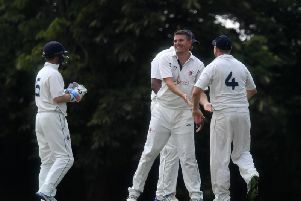 Olney are playing themselves into Four Counties Division 1 title contention after winning their sixth match in a row on Saturday, beating Eaton Bray. Jeremiah Shields and Peter Young helped Olney to a commanding position in the first innings, with Shields top scoring with 96, while Young fell just shy of his half century on 48. James Flecknell was the pick of the bowlers for Eaton Bray as he took 3-43, while Ian Jones - Bray’s sixth bowler on the day - took 2-34 as wickets proved difficult to come by for the visitors as Olney closed on 196-5. Eaton Bray were immediately on the backfoot with the bat, losing Joe Braddon for just 2, with Lee Gauntlett (1) joining him in the pavilion with the score reading 12-2. Flecknell started Eaton Bray’s recovery with 46 as the middle order set about salvaging the innings. Glenn Hearn (31), Jaco Jacobs (25) and Jamie Osborne (27) all hit vital runs in the middle order to give the visitors a sniff at victory. But two run outs late in the day and a caught and bowled from Iain Keeping left Eaton Bray needing big runs in the closing stages to win it. Ultimately, they came up 15 runs shy of the mark, with Ian Jones run out in the final over.